5 Light Inverted Pine Cone Chandelier. Our rustic 5 light pine cone chandelier features dimensional pine cone and boughs. Down turned amber glass shades cast light from five 100 watt bulbs on to your dining or kitchen table. This rustic pine cone chandelier will adorn your cabin or lodge style home with the beauty of the outdoors. 5 Light Inverted Pine Cone Chandelier. Our rustic 5 light pine cone chandelier features dimensional pine cone and boughs. Down turned amber glass shades cast light from five 100 watt bulbs on to your dining or kitchen table. 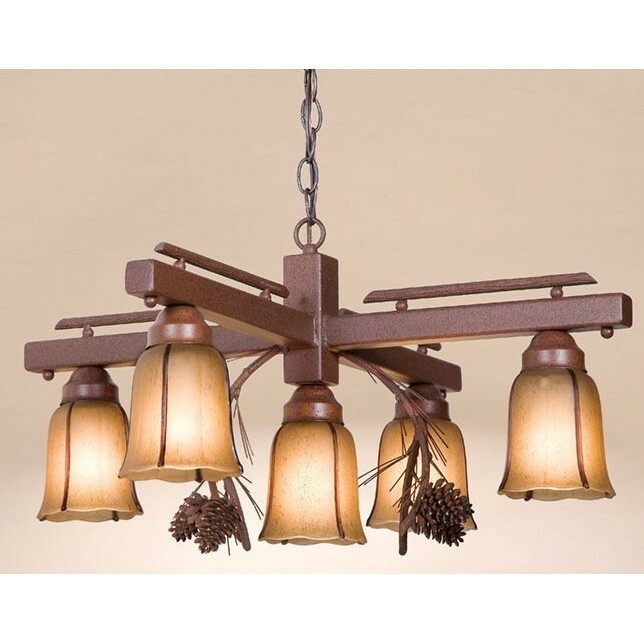 This rustic pine cone chandelier will adorn your cabin or lodge style home with the beauty of the outdoors. Chandelier includes 3' of chain and ceiling canopy. It measures 27" in diameter x 13" high, is UL listed and uses five 100 watt bulbs (not included). Hanging weight is 16lbs. Made in the USA.